Thursday we have our first artist talk of the semester with Cathy Lee Crane, a video artist and performer who has Guggenhiem Fellowship on her resume along with several other prestigious honors and awards. Her talk begins at 5:30 on March 1st in the Center for Theatre Arts (take note, not the usual place). This weekend some of our art students are having a pop up art sale in the basement of the Bank of the West. It starts Friday night at 5 during the downtown Art Ramble and ends Saturday at noon. Please the poster for hours and directions. 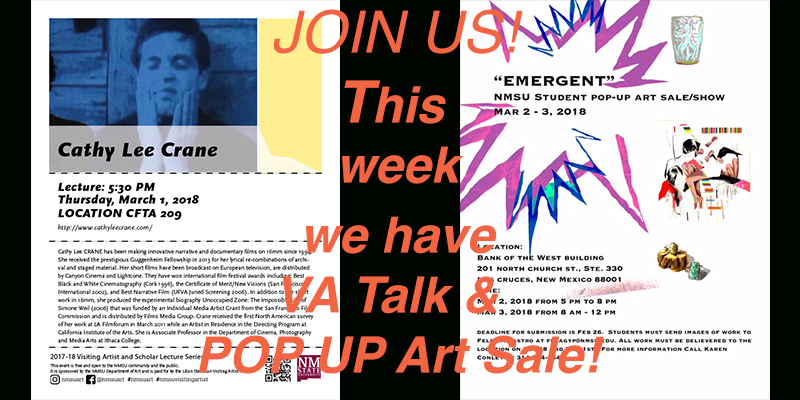 This entry was posted in Event, NMSU Art Students, Visiting Artist and tagged #cathyleecrane, #contemporaryart, #nmsuart, #nmsuartdept, #nmsuartstudents, #popupartsale. Bookmark the permalink. Follow any comments here with the RSS feed for this post. Both comments and trackbacks are currently closed.